VOTED BEST ON TOUR 2019! 2008 CUSTOM TERRITORIAL ON 1.25 ACRES. IMPRESSIVE PAVER ENTRY/DRIVEWAY LEADS TO 3,710 SF SINGLE LEVEL 3 BEDROOM + OFFICE, 3.5 BATH HOME BOASTING TRAVERTINE FLOORING, 20′ CEILINGS, 8′ SOLID CORE DOORS & VENETIAN PLASTER. GOURMET KITCHEN OFFERS CHISELED EDGE GRANITE, PROFESSIONAL VIKING APPLIANCES, CUSTOM WOOD CABINETRY & HUGE ISLAND THAT IS OPEN TO BREAKFAST ROOM & LIVING ROOM. MASTER RETREAT FEATURES MAGNIFICENT STONE FIREPLACE, SNAIL SHOWER W/DUAL SHOWER HEADS, JACUZZI TUB & FABULOUS WALK-IN CLOSET. DYNAMIC SUPERSTITION MOUNTAIN VIEWS FROM DINING ROOM & ENTRY. EXTENDED COVERED PATIO PROUDLY PRESENTS 2016 HIGH END AUTOMATIC SHADE SCREENS & OPENS TO SPARKLING POOL. SPACE FOR HORSES, DOGS, RV & TOYS ALL ON FULLY FENCED PROPERTY. NO HOA. 2018 ROOF RE-COAT. Directions: FROM US 60, N ON MOUNTAIN VIEW RD, R ON SOUTHERN AVE, L ON GERONIMO RD TO HOME ON LEFT. Approximate size: 54450.00 sq. ft. Please, send me more information on this property: MLS# 5861816 – $740,000 – 2206 S Geronimo Road, Apache Junction, AZ 85119. 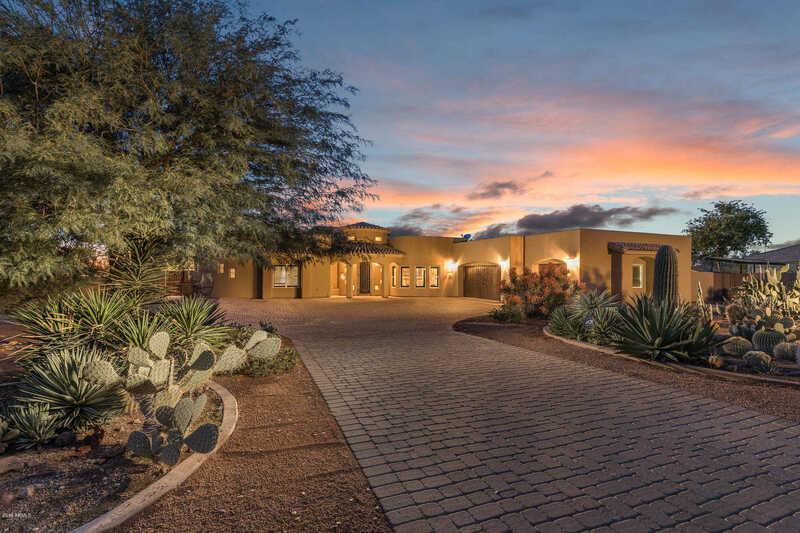 I would like to schedule a private showing for this property: MLS# 5861816 – $740,000 – 2206 S Geronimo Road, Apache Junction, AZ 85119.